Some emigres are considering a return to Russia, while some are actively participating in the protests. Every evening at 8pm, Sophia Khadzhibekirova, 45, comes out on to her balcony and starts banging on a saucepan with a steel spoon. That is how many Turkish women - looking after children at home - have been joining in the mass demonstrations that have engulfed the country’s major cities. Khadzhibekirova came to Istanbul from the Russian town of Essentuki 15 years ago, got a job at a tourist agency, married a Turkish man and gave birth to a daughter, Yasya. “[Turkish Prime Minister Recep Tayyip] Erdogan does as he pleases; he thinks too much of himself and doesn’t want to listen to what people have to say,” she says. “You see, I love Turkey very much because it is a secular and Europeanized eastern country, where women have always been respected and cared for," she says, adding: "And I want it to stay that way. However the standoff with the government ends, I don’t want to leave." Turkey has been the scene of mass protests against the policies of the ruling party and calls for resignation of Erdogan. 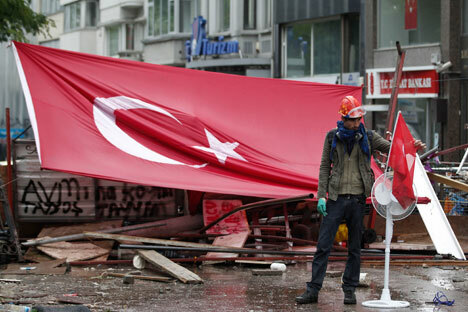 The authorities’ plans to put up buildings on Gezi Park, one of Istanbul’s few green spaces, located on the European side of the city near Taksim Square, triggered the protests. In a surprise for the government, rallies of solidarity with the tree-huggers broke out in many cities and were quickly transformed into mass demonstrations against the regime. Oksana Lukina, a Russian executive at a prestigious international firm, has lived in Turkey for six years. Every evening she attends rallies together with her entire office staff. “I live in the center with my boyfriend and, at the end of last week, we couldn’t even open the windows because of a strong smell of gas," she says. "I was letting the victims into our home to treat their wounds." According to local government statistics, Turkey is home to as many as 1 million immigrants from Russia and around the former Soviet Union. The biggest concentrated Russian communities live in Istanbul (18,000), Antalya (around 10,000), and Ankara (5,000). The rest are dispersed across hundreds of Turkish towns and cities. Their attitudes towards the current developments in the country differ. Inessa Khadzhibekirova, 23, is Sophia Khadzhibekirova’s eldest daughter. After emigrating from Russia with her mother, she graduated from a Turkish university and is already making decent money by local standards. Inessa has visited the Taksim Square protests several times and said she was seriously considering going back to Essentuki, where she has friends and family, but is now considering a more radical step - going back to Russia. Istanbul’s Laleli district is locally known as “Little Russia”. Russian is spoken in the streets and shop signs in Russian warn customers to watch their step. Many Russian immigrants to Turkey got their first local jobs in Laleli – a textile and fashion hub. Wholesalers come here for merchandise for resale in shopping malls all across Russia. “Relatives are calling me every day, saying: 'How are you? Have you bought a gas mask? Aren’t you scared? '” says Nargiza, a Turkmenistan-born woman who considers herself Russian. During her nine years in Turkey, she has risen from a simple sales assistant to the manager of Fimka, a large online fashion store based in Laleli. “It’s calm around here but, because the TV news showed how the police gas people, several big suppliers from Russia have refused to come pick up the merchandise," says Nargiza, who declined to give her last name. "We have already lost around 20 percent of sales." Not all Russians living in Laleli are ready to openly talk politics or discuss how the recent developments are affecting their lives, however. One woman, Katya (not her real name), says that those working in her store are mostly supporters of Prime Minister Erdogan, with only three people supporting the protests. “I have two kids and I don’t want any trouble,” she says apologetically. “I tell my friends the truth: Yes, Taksim and other cities are on strike but Istanbul is a huge city and it’s calm in other districts, so don’t be afraid and come and visit us, as before." Natalya was born in Russia but has long been a Turkish citizen; she has an prosperous husband and three children, and lives across the Bosphorus, on the Asian side of Istanbul. We made an appointment in the city center but she called at the last minute to cancel: her husband had advised her not to talk to journalists. “You see, we’ll stay here. We have no idea what the consequences will be for us later," she says, sighing heavily. Some 3,5 million Russians visit Turkey on vacation every year. Despite the political crisis, the flow of tourists has not ebbed, according to Turkish tour operators. Yet there are fewer European tourists on Turkish streets, while several cruise ships have cancelled Istanbul port calls because of the unrest.